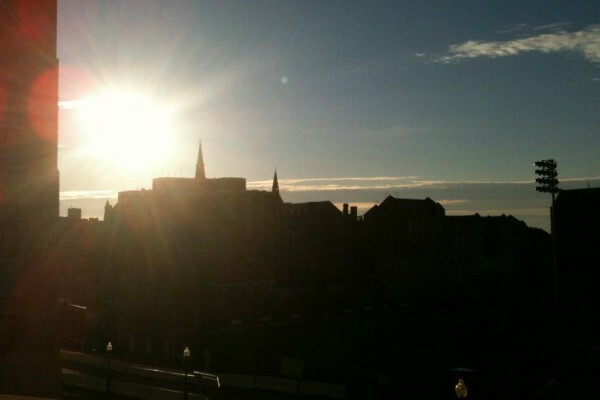 Founded in 1751, Georgetown is the oldest neighborhood in the nation’s capital. With its cobblestone streets and trolley car rails, Georgetown combines old-time charm with quaintness and wealth. But while the centuries-old architecture remains mostly unchanged, the neighborhood is one of the most thriving, affluent areas in the district. Home to many prominent past and present figures, including Julia Child, former President John F. Kennedy, and current Massachusetts Senator John Kerry, the area is well-known for its million-dollar plus town houses. Although it lacks its own metro station, Georgetown’s shopping on Wisconsin and M Streets is reminiscent of New York City’s Fifth Avenue, as well as the area’s fine dining, make the neighborhood worth a visit. Not only can diners find upscale cuisine, but as the home to Georgetown University, the area also caters to the local, finance-stretched college students. The combination of high end restaurants with late night eateries and bars ensures that politicians, tourists and college students alike are all well fed. Having hosted President Obama and his daughters this past fall, Thomas Sweet, or T Sweets as it is often called by the locals, is definitely worth the visit. With its seemingly endless list of flavors scribbled on a chalkboard above the counter, the shop has something fro everyone. From the traditional, like vanilla and strawberry, to the more outrageous, such as French Kiss (Dark Chocolate Raspberry Mousse with Bittersweet chocolate chips) and Eastern Chai, T Sweets has a variety that enables visitors to build memorable, decadent sundaes. The shop is cash-only, so be sure your wallet holds a few bills or else your cone will have to wait. If you ask Georgetown students their opinions about the area’s best cupcake, answers are often spilt between Georgetown Cupcake, the setting of TLC’s popular program D.C. Cupcakes, and Baked and Wired. Loyalists of the latter skip the former’s lengthy lines and instead hang out in this cozy bakery. Cupcakes flavors range depending on the season, but some of those available year-round include Pretty Bitchin’, a chocolate cupcake with crunchy peanut butter frosting, and The Tessita, a vanilla cupcake with dulce de leche filling and chocolate-hazelnut icing. Choosing a cupcake is made even more difficult by the tempting array of baked goods also available. When you prefer something a little more on the healthier side, Hippie Crack, the shop’s homemade granola, is the perfect accompaniment to one of the handcrafted coffee drinks on the menu. Washington’s only European creperie, coffee shop and bistro bar, Cafe Bonaparte is an ideal date spot. Its menu includes a range of crepes, both sweet and savory, in addition to other classic French dishes, such as french onion soup and steamed mussels. The menu’s range ensures that carnivores and vegetarians alike will be satisfied. Concluding the evening with cappuccinos and nutella crepes increase the chances of a second date. The go-to place for every Georgetown student looking to avoid another night at the dining hall, The Tombs is a neighborhood icon. Whenever a local Hoya turns the big 2-1, this is the first place they head. On midnight of their 21st, birthday celebraters flock to The Tombs for a stamp on their forehead proclaiming their legal status. The restaurant also hosts the 99 Day Club which invites loyal patrons to visit and eat or drink something in the restaurant for 99 straight days. There are strict rules to the club, including an out of town absence stipulation that requires mailing a food/drink recipient from another restaurant or bar. While it might be located right outside the gates of Georgetown University, the restaurant and its menu appeal to everyone with an appetite for good food. With the arrival of parents and their wallets, Parents Weekend is best spent dining at those local restaurants students’ allowances preclude them from entering. When convincing parents where to go, 1789 is a great choice for delicious, high-quality food served in a formal setting. Though the menu is pricey, the opportunity to dine on lasagna with lamb shank confit or fresh Maryland rockfish makes every penny worth it. The menu changes daily, and each item is prepared with fresh, local ingredients. If parents need further persuasion, just tell them that President Obama and Paul McCartney are just a few of the restaurant’s notable fans. When hungry Hoyas have only a few dollars in their wallet and prefer a quick bite, Wisemiller’s is a favorite place for cheap local eats. Located just beyond the steps of the university’s library, Wisemiller’s has a wide variety of salads, wraps and sandwiches, including the ever-popular Chicken Madness, made with fried chicken, provolone cheese, mayonnaise and bacon. While one’s bank account may be safe here, the same cannot be said of one’s diet. If you’re looking for something a little lighter, all one has to do is walk the short distance to Wisconsin Avenue to visit Wisemiller’s healthier cousin, Wisey’s (1440 Wisconsin Ave NW // (202)-333-4122). Both stops provide guilt-free sustenance—at least, in terms of your finances. Whenever anyone suggests meeting up for coffee, Saxby’s Coffee is probably the spot. This corner coffee shop attracts students and neighbors at all hours of the day. Its menu includes the traditional doses of caffeine, but offers various takes on the classics with the addition of different flavorings and toppings. Those looking for something to accompany their cup of joe can choose from pastries, prepared sandwiches, hot oatmeal and even frozen yogurt. If lucky enough to linger at a table, it is nearly unavoidable that one will see a professor or neighbor order at the counter. An implant from New York City, Serendipity 3 is Georgetown’s newest dessert emporium. Although its sundaes have always been legendary, the restaurant rose to even greater fame since the 2001 film Serendipity, starring John Cusack and Kate Beckinsale. The restaurant has an extensive menu, but it’s desserts that lure people to the table. Perhaps its most popular offering is its Frozen Hot Chocolate. Available in multiple flavors, including Traditional and Moccchacino Cafe, the treat is best ordered to share and enjoyed with two straws. Georgetown has its share of ethnic restaurants, but Das offers something different from the Mediterranean and Asian restaurants in the neighborhood. Formerly known as Zed’s, the restaurant is a favorite among D.C.’s political actors and visiting celebrities. In fact, patrons are welcomed with a display of prominent diners’ photos. One can imagine that most diners who come here to eat have little knowledge about the cuisine, but this does not hinder their adventurous appetites. Ethiopian food is known for its spiciness and is usually eaten with injera, a spongy sourdough flatbread made from teff flour. For those looking for a little bit of everything, consider ordering one of the menu’s sampler platters, such as the Vegetarian Platter with spiced lentils, collard greens and simmered cauliflower. Using the injera instead of silverware is key to authentic Ethopian dining; just don’t fill up too much on the bread—once digested, the bread can actually expand in the stomach and leave over-fed diners with a bellyache. Martin’s Tavern may not be the most upscale restaurant in Georgetown, but that did not stop former President John F. Kennedy from proposing to Jackie Bouvier here. The chance to dine at the booth of the proposal keeps people coming in the door. The restaurant and tavern has been serving politicians and plain folk for 78 years, and its menu continues to satisfy. Favorites include the Tavern Treat, sautéed jumbo lump crabmeat and sliced mushrooms served over an English muffin and topped with Hollandaise sauce, and the Martin’s Delight, sliced roasted turkey on toast smothered in a homemade rarebit sauce, topped with sliced tomato, parmesan cheese and bacon, and then broiled. Martin’s food may not be as elegant as that of a White House State Dinner, but that hasn’t stopped politicians from reserving a table. While walking along M Street it can be easy to miss the passageway to Cady’s Alley, but once discovered, you’ll never miss it. Located on the corner of the alley’s courtyard, Kafe Leopold is a unique twist on classic European dining. A modern version of an Austrian konditorei, the spot is a bakery, coffeehouse and cafe all at once. The cafe offers breakfast, lunch and dinner, and all menu items are served a la carte. After filling up on Gegrillter Lachs, grilled salmon with crushed cucumbers, dates, walnuts, fennel and basil oil, there will be little room for dessert. But after eyeing the Praline Mousse or Topenforte, cheesecake marbled with mango and filled with passion fruit jelly, one might be unable to resist a sweet treat. I agree with the majority of your suggestions however, you could have added a few more categories. 4) Vegetarian Restaurant – ? I love all of your suggestions! As far as a vegetarian restaurant, maybe the best would be Sweet Green. I have never been to Marcel’s, but I will definitely have to check it out. I’m so excited to try these when I get back to DC! I haven’t heard of the majority of your suggestions, but they all sound great!